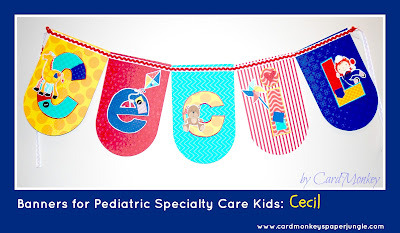 This weekend, I combined my work and my hobby (again), by making welcoming banners for two baby boys admitted last week at Pediatric Specialty Care. The banners I've made for each child as they come in are quite a hit with the staff and families, as they both brighten and personalize a child's room. To cut the pennants, I used Cricut's Art Philosophy cartridge. 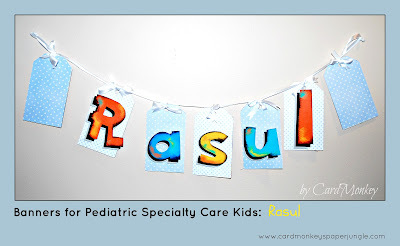 For the names, I chose fonts from Lettering Delights, which I printed out, fussy cut, lined with a colored cardstock and popped up on the pennants. which I printed on my home computer/printer. This summer, about 40 friends -- wonderful crafters, all! -- will be making and donating Halloween-themed banners for the children at PSC. If you'd like to join in the fun, please send me an e-mail at cardmonkey@comcast.net. We're still looking for more banner makers, as well as those who'd like to make a banner and post about it a Labor Day weekend blog hop. These kids truly appreciate your talents! Thank you for your lovely comment on my blog! You have a fabulous blog hun!